In todays News and Observer there is a new article with mention that a Louisiana company is buying 260 acres at Louisburg Rd.(U.S. 401) and the new 540 exchange. Currently the 25ft. tall Scarecrow stands on this property with horses in the background on the farm. Commercial Properties Development want to build multistory office buildings and hundreds of homes on the property. I kinda expected this to happen in that area once 540 was open at 401. I will kinda miss the gigantic man though. I have also thought in the past that this will be the area, along with TTC area, that the city will try to brand as "uptown". I have noticed that there is already a new housing development being built just a little north of that intersection, and Wake Tech's northeast campus is being built in that area as well. I like the big man. I miss unique, cartoonish pieces of marketing here and there. They give an area character. Compare South of the Border to that strip mall 25 miles north of it. See what I mean? Yeah, it's tacky and all, but it really isn't any kind of mockery of the landscape. I think abandoned agricultral fields really aren't any prettier than Pedro's hat tower. Did anyone see that Simpson's Halloween special where the giant marketing characters came to life and attacked the city? Pretty funny. A while ago there used to be three of them out there, now there is only the one. There was one in Rocky Mount years ago as well, but it was taken down for some reason. According to the story, the land owner sells a sand/dirt mixture for baseball fields and is taking the big guy with him wherever he ends up. He may show up somewhere in Rolesville or the far side of Louisburg. It could be a neat landmark for Triangle Town Center, to go along with that stupid rock in the food court. Maybe put it in place of the fountain in the "street" portion? Or move him to North Hills Phase 2! In addition to the Big Sombrero, The "standing Pedro" at SotB on the campground side is an impressive landmark, especially at night. Lard Lad would be proud! Stupid 540. I hate that road second only to Capital Blvd. That being said, Tay, you are better off with multi-story office instead of a super wal-mart, or the standard Target-Home Depot setup for avoiding a capital blvd type deal. Office buildings go quiet after 5, retail corridors stay clogged until what 9 or 10 pm or so.....if you are choosing to live in that part of the County, which comes with all the concerns related to an auto-dependant lifestyle, you are getting a relatively decent scenario...all this of course within the assumption that development must occur. Yeah, it is sad to have to watch the old guy move again. Does anyone else remember when he used to hawk paint alongside Downtown, er Capital, Blvd. just outside of the Peace St. overpass? This would be about the same time that Leith Mercury had their 16 - 20 foot cougar crouching on their Downtown Blvd. lot. I hope he winds up closer to Rolesville since he would still be in the county. Does anyone know if the 20 ft. tall miner from the old Daniel Boone Center in Hillsborough is still around? I'm totally against this. I love the Big Man. saw it for the first time last week. i couldn't help but laugh. its things like this that bring uniqueness to an area. i guess raleigh is trying to be as textbook as possible. Seriously, you have no right to complain. You're the one moving out to the exurban fringe for your house, and in the "free" market of real estate development, "retail follows rooftops." So does office space. When you chose to buy a house in the Wake Crossroads area, you helped seal the fate of the "country" out there by pushing up the demand for land, which made that area ripe for development for strip malls, frypits, and the usual suburban dreck that will come with it. If you want to see what your neighborhood will look like in ten years, for optimism, visit Brier Creek and the nearby residential developments. For pessimism, visit intersections of major roads like Six Forks with I-440. 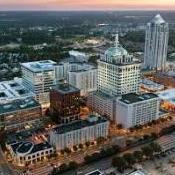 If you want to see what that part of Raleigh will look like in 15 years, visit Herndon, VA. I also don't see how suburban cul-de-sacs somehow don't ruin the rural landscape more than multistory office towers do, but I guess that's in the eye of the beholder. RALEIGH -- The city's planning commission endorsed plans today for the massive 5401 North development at the intersection of Interstate 540 and U.S. 401. The City Council, which makes the final decision, will consider the plans next Tuesday. It's likely the project will be approved. The development will mix offices, shops, restaurants, housing, an elementary school and park on about 260 acres. It will include more than 1,100 homes, apartments and condominiums and more than 1.6 million square feet of space for offices, shops, restaurants, a hotel and other businesses and amenities. Here's the WRAL story with video. It's right near the intersection of US 401 & I-540 in NE Raleigh and bounded by the Neuse River to the east... named "5401 North." It's been described as a Meadowmont-like mixed use development. If anyone cares to look at the gory details, here's the Planning Commision info page. That area is a nightmare-my fiance's sister/husband used to live out there and always dreaded the drive out to visit. Now we just have to drive to Clayton which is equally horrendous in other ways. I got the impression that they knew the area's traffic was bad now and would get worse without this project, so they decided to approve it anyway. Have they ever heard of the word "no"? EDIT: Read it again and they feel that planned traffic improvements will alleviate any problems. We've heard that one before. One of two things has to change...either these type of developments cannot be so self contained in that they do not have many connections to the rest of the city, or serious transit alternatives must be made available. I see 4 entrances/exits to the entire development, and yet it is referred to has having an "urban nature". I have boiled all developments down to two points, is it designed well and is it connected well.....this one while it may or may not pass on the first count appears to fail miserably on the second. When the developer says it's "urban in nature" he means that it's mixed use (residential, retail, office), will internally "capture" some level of auto traffic, and is walkable WITHIN the development, such as at Southern Village in Chapel Hill (but I wouldn't want to walk from So Vill to old Chapel Hill). Land constraints (Neuse River and 540) make connectivity exceedingly difficult. Honestly, the most I'd hope for is that the city asks for connectivity *and* good access management on 401, along with some level of bike & transit accomodation. Yeah, that is what urban has come to mean, which is not all bad...I guess I think of those design elements as 'small town in nature'. Capturing as much traffic internally as possible with services and retail nearby does help, but I am worried that at rush hour the entire development will have to empty out onto that single connection to 401 to get onto 540(or head downtown)....the nightmare at Wake Forest Rd and the Beltline is a vision I was thinking would be comparable to where this is heading as far as congested interchages with over capacity intersections nearby goes. It'd be nice if we started requiring all of these "mixed use urban villages" to set aside land for a RoW for future rail and a rail stop. Perhaps during the approval process determine that a rail route is most likely going to go in x direction, set aside the land for at least 20 years, if rail isn't there in 20 years it will revert back to the developer. This project was another one approved today by the council. Everyone (incl planners Stephenson & Crowder) spoke highly of it, so maybe it's a lot closer to a Meadowmont/S Village-style new urbanist project than I thought. They did leave lots of open space near the river and space for a future school and rec center. In related news, the new stretch of 540 going through this area opens this week. anyone have a map of this leg and future legs of the project to come? I noticed the 5401 developers have resubmitted plans for the site. From the looks of it, it may have been due to altering roadway alignments, but it's hard to tell from the attachment. Has anyone been out that way to see the progress? It's just north and east of the 540/401 interchange.